-Class sizes vary according to what is being taught. -Contact us through em﻿ail (palouseriverquilts@gmail.com), phone (509 397-2278), regular mail (101 S Main, Colfax WA 99111) or walk in to sign up for your class. -When you pay for the class you will receive the class supply list. -15% discount on supplies purchased at the shop for your class! -We have a limited number of sewing machines available for your use, but please let us know when you sign up for the class that you need to use one of our machines. -We will contact you at least three business days prior if a class is cancelled and you will receive a full refund. -To receive a full refund, you must contact us a least three business days prior to the class if you want to cancel. - Classes run from 10 am to 4 pm unless otherwise noted. Our final October class is a table topper entitled “Calliope.” This project is made with a 15 degree squedge ruler and has slices of fabric radiating from a center. It is a complicated design made easy. The class is $35 plus the pattern and ruler. 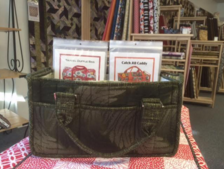 Patterns by Annie have a terrific project bag call “Catch All Caddy.” It makes a project organizer that is perfect for hauling your quilting supplies to class or keeping your quilting room tidy. It has pockets galore as well as a zippered pocket for personal items. The class is $35 plus the pattern. Class meets from 10:00 to 4:00. 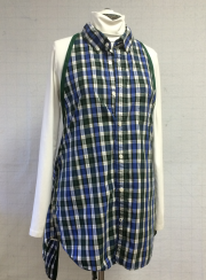 Find a used man's shirt and make an apron out of it. Sound like fun? It is. Renee Ray is teaching this technique. You can give it frills, add a ruffle, or keep it plain. Whatever tickles your fancy is what you can do. You will end up with a very cute apron. The pattern is "Kitchen Shirt Tales" by Indygo Junction. This table runner is easy to make and beautiful when done. Join Margo for a class that is sure to be fun and re﻿warding. 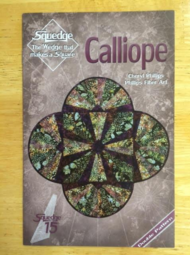 The required book, Singular Sensations, shows how one block can make a large variety of designs for quilts, table runners, and other projects. Limit of four participants. 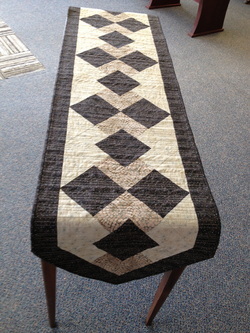 The second table runner is from the pattern "Serenity Circles" and teaches students how to deal with piecing circles. This class has been successful in the past and we are bringing it back for you to enjoy. Have you ever wanted to learn to hand quilt? Margo has been hand quilting for 30 years and has mastered this art. She will show you techniques for basting, marking and hand quilting your treasure. 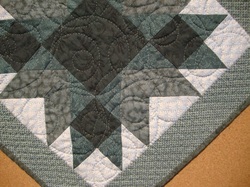 Hand quilting is a time-honored tradition and you are sure to learn a lot in this class. Limit of two participants, or, arrange a one-on-one class with Margo.